Costumes worn by Peter Mayhew (Chewbacca) and Harrison Ford (Han Solo) in the original "Star Wars" trilogy, are part of a new exhibit in Times Square. A new museum exhibit opening this weekend in New York City features dozens of real costumes from the seven "Star Wars" movies, and serves as an illustration of how the creative process turns ideas into reality. The exhibit, titled "Rebel, Jedi, Princess, Queen: Star Wars and the Power of Costume," features items from every corner of that galaxy far, far away, ranging from Boba Fett's banged-up armor to many of Queen Amidala's ornate gowns. The exhibit is currently on display at the Discovery Times Square museum. Costumes from the upcoming movie "Star Wars: The Force Awakens": (l to r) Finn, Rey, Poe Dameron. 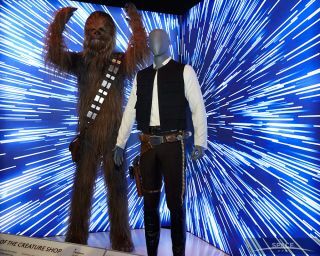 The more than 70 costumes featured in the new exhibit range from some of the most iconic outfits from the "Star Wars" universe, such as the Wookie costume worn by Peter Mayhew, who played Chewie, and Han Solo's simple, Western-inspired getup. There are also six costumes from the new movie "Star Wars: The Force Awakens," set to be released in December. Multiple sections of the exhibit are dedicated to gowns, dresses and other costumes worn by Queen Amidala in the "Star Wars" prequels. Some of the dresses took months to make, French said. Many of the dresses worn by Queen Amidala in the "Star Wars" prequels are on display in Times Square, as part of a new costume exhibit. "The whole point of the exhibition is to show the authentic, actual items," French told Space.com. "Especially when you get into the queen's costumes. The vintage fabric, the couture-level garments, you can't replicate that. Even if you tried, it would never look as good. So we really wanted to show the real deal." French emphasized that the exhibit is more than a showcase of the costumes: The garments are used to illustrate the creative process in action. Accompanying most of the costume displays are information kiosks that give more context to how the costumes were created, such as drawings and sketches that inspired the costumes, or fabric swatches. In addition to the actual costumes, the exhibit features early drawings of the characters and their clothing, to show how ideas turn into realities. Here, some early sketches of what a Wookie like Chewbacca would look like. There are also historical or anthropological inspirations for the costumes, such as a photo of the Mercury 7 astronauts in their orange flight suits, which directly inspired the similarly colored suits worn by pilots in the Rebel Alliance. The Lucas Museum was founded by George Lucas, the creator of the "Star Wars" universe. According to its website, the museum is "the first museum of its kind, its unique collection features popular art from illustration to comics, an insider’s perspective on the cinematic creative process, and the boundless potential of the digital medium." It is scheduled to open in Chicago in 2018. The exhibit will be on display at the Discovery Times Square museum through Sept. 5, 2016. After that, it will travel to other museums in the United States.